Sitting here in my room at the end of full day one. Having had a reasonable nights sleep last night I woke at about six and came straight into the office as I presumed it would be warmer there than in my apartment which for the moment is true. Dressed in a few layers now I’m quite cozy and have just bought a pot and some tea which is warming me up nicely. I wrote my last post this morning before the Saturday morning seminar. I presumed this would be a reasonably relaxing affair and after I stood up to introduce myself the seminar proper started. Three hours later the introduction to supersymmetry, cp violation and rare B decays was over and we had our Chinese take-out sitting around chatting. I thought it was all over but was then told that one of the students was about to have an oral exam and everyone else was going to stay so I could if I wanted. It seemed like poor form to skulk off on my first day even if it was a Saturday so I stayed. Up came the slide titles “introduction to the standard model of cosmology”. A talk I’ve seen many times before…never however have I seen a two hour version in Mandarin! I think it was only supposed to be an hour but people got into a big argument half way through (about what I’ve no idea!) and so it continued. Anyway, at the end of this five hours of talks eating into my first Saturday which was set aside for resting and seeing the area I was asked if I wanted to give a talk in two weeks time which it looks like I’m doing. There are no strings theorists who come to this meeting so my talk will be a complete introduction to the AdS/CFT correspondence which sounds like fun to me. Apparently I can take several hours if I want. Hooray. Anyway, the rest of the day was spent doing a bit of shopping, walking around the area and catching up on a bit of sleep. I’ve had another delicious meal this evening of dumplings, the contents of which are a guess. Pork I think. tomorrow I’m planning on heading to the Forbidden city and surrounding area with a Taiwanese guy from the office who does speak Mandarin and hopefully will insure that we get there without taking a horribly circuitous route. Just to give an impression of the area around here, here are some photos of the campus. 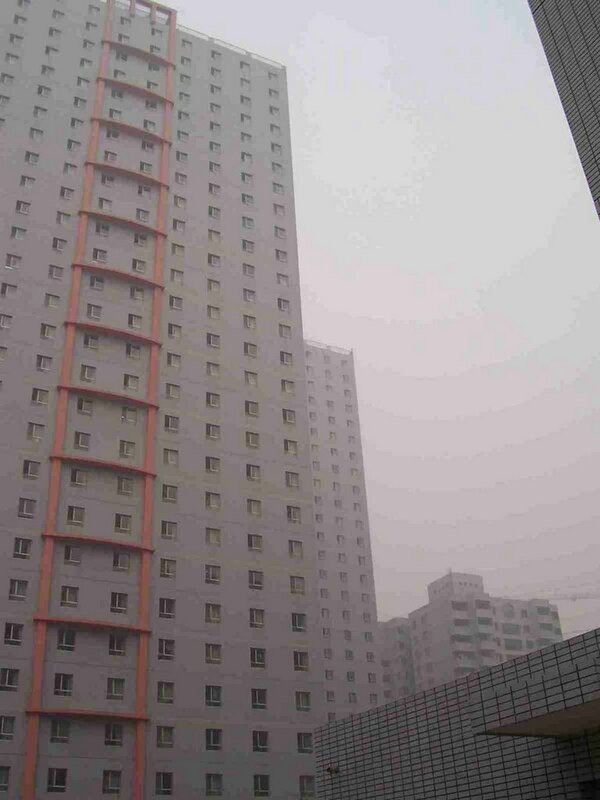 The first is of the enormous apartment blocks which must house getting on for 1000 students each. My block is the small one in the background (only 17 floors). 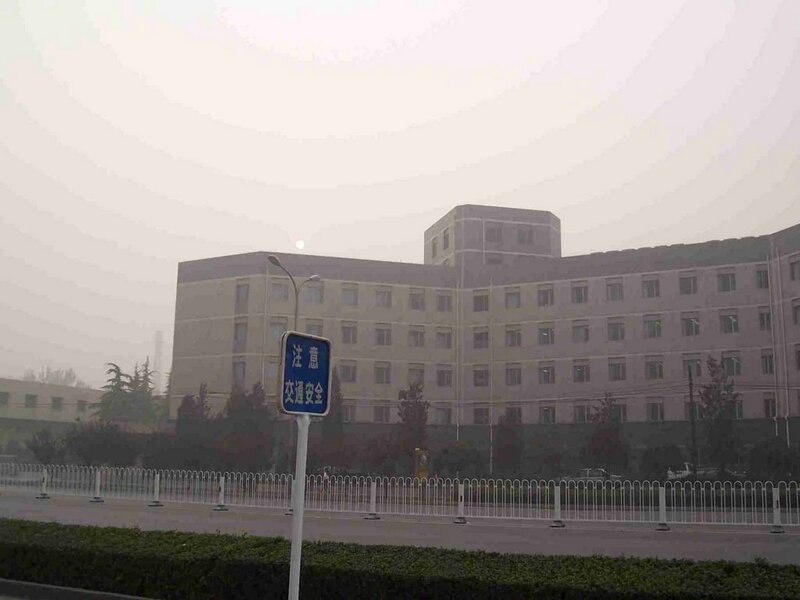 The second photo is of the department with the sun peaking through the fog and smog. I think that today it’s also a little foggy which is exaggerating the extent of the smog but it’s pretty dire whatever. I’ll be truly astounded if all of this can be cleaned up by 2008 which is the promise. Anyway, as full day one draws to a close I’d say that things are pretty good. As I said before, the work is going to be tough but hopefully everyone else’s enthusiasm will be a good motivation for me. At the moment I’m not sure when I’m going to be able to fit in Mandarin lessons but I’ll see what I can sort out on Monday.